Media buzz over the British royal family – in particular their current youthful standard-bearers, Prince William and Kate Middleton, the Duke and Duchess of Cambridge – has been relatively subdued as of late. This is the nature of royal-watching, as opposed to the promotional vagaries of entertainment celebrity. Unlike pop singers with new albums to sell or movie stars with new film releases to promote, the British royals don’t really do anything that contributes in an immediate wqay to our mass culture. There’s no consumer-capitalism-driven reason to push them to the fore, most of the time. If there’s clear popular interest that drives media coverage of the monarchy, it’s not related to any sort of time-sensitive product release. At least, not most of the time. Media interest in Will and Kate has spiked again recently with the public announcement that there is something new on the way: the Duchess is pregnant with another heir. The Windsors can’t seem to get enough of those, in these contemporary times of minimal mortal danger to lines of succession to the throne (Henry VIII would die of envy at the abundance, were he not already a corpse of long standing). The hands of the monarchy and their handlers seems to have been forced to some extent in the timing of the public reveal by a minor health crisis for the expecting Middleton, who was hospitalized early this week for severe morning sickness. What followed was the usual media blitz, which is entirely characteristic of the British tabloid press but only exacerbated by the established international celebrity of its principals. This is the most well-protected wheelchair ramp in all of the British Empire. As the cameras and microphones and their wielders stood vigil outside of King Edward VII hospital in London waiting for updates, an absurd tragedy began to unfold in this shimmering spotlight. A pair of radio DJs from Australia (since suspended from the air) executed what they likely believed to be an amusing prank call at the time, phoning up the hospital to check into Middleton’s condition while pretending to be Queen Elizabeth II and Prince Charles. Some of us had a laugh with them, some of us engaged in some hand-wringing over the security breach, but no serious consequence from the incident seemed to be forthcoming. Then, the news broke that the duty nurse who transferred the call through to another nurse (who dutifully gave out the requested info to the presumed monarchs) had turned up dead just days later. Suicide over the humiliation of being duped in the care of such a high-profile patient was the widely speculated cause in the death of Jacintha Saldanha (and how English a reaction would that have been: death from mortal shame). 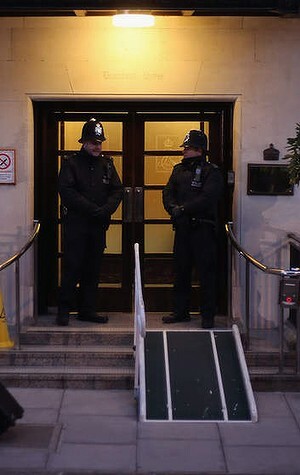 No official statement of cause has been forthcoming from Scotland Yard, who are calling the death “unexplained”. Thus followed recriminations of and apologies from the Aussie radio station, statements from the various parties including the word “tragic”, and, of course, even more hand-wringing. As we are well aware, this would not be the first time that the breathless media predators circling the gilded form of the British royal family have wound up with blood on their hands, if the Australian prank call is indeed judged to be the fatal catalyst. William himself, we can’t forget, has felt the sting of this sort of thing rather more personally before, and it may be that he’ll make some more direct statement about it drawing on past experiences when more information comes to light (or maybe not; the stiff-upper-lip stuff is also highly English). But the ironic juxtaposition of death alongside the promise of a new life, a life sure to be lived in the same harsh glare that its parents have experienced, is interesting as a metaphor for the ravenous fame machine that is sure to entrap this unformed infanta. A fairly inspired Twitter account for the Unborn Royal is already providing a commentary on the convergence of power, fame, and infantile innocence to be put on display. Will the hype monster around the royal family of Britain expand its appetite to matters of mortality as well as of birth? It seems like it already has, whether it would choose to or not.